Take time--or rather, make time--to truly enjoy your next party by using one of ScrapSMART's Party CDs! 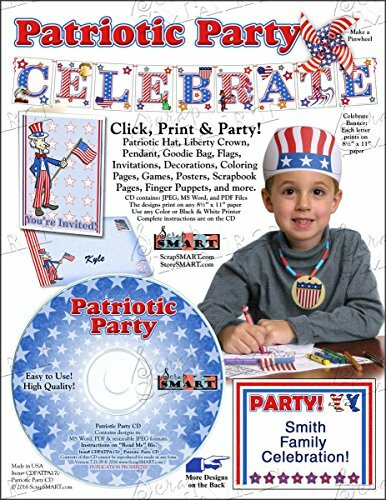 Our Patriotic Party CD provides all the decorations and activities you'll need to throw a party that'll have everyone talking. Avoid frenzied hunts for just the right game component or decoration--this CD includes games, coloring pages, and wearable accessories, all in one place. (The best part? You can print the amount you need! Save money and resources, and welcome unexpected guests by printing off supplies on demand.) The patriotic theme will appeal to freedom lovers of all ages, and can be used for Fourth of July parties, government events, and VA hospital fundraisers. Check out our other themes: Dino Party, Teddy Bear Party, etc. All pages are 8 1/2" x 11" and fit on standard copy paper. Many designs can be personalized with your child's name or photograph. For added fun, print the designs on iron-on transfer sheets or printable fabric for one-of-a-kind t-shirts and keepsakes! CD Features: No software to install. PDF, MS Word, and resizable JPEG files for all designs. Invitations, thank-you notes, and envelopes. Decorations: 10-foot-long celebration banner, goodie bags, place cards, posters, cake decorations, party sign, and cup labels. Activities: Uncle Sam hats, Liberty crowns, medallion necklaces, finger puppets, flags, Pin the Hat on Uncle Sam game, pinwheels, and black-and-white coloring pages. Scrapbook page and printable photo page. Full instructions and a party checklist. Usage Specifications: All designs print on standard 8 1/2" x 11" sheets. Use with cardstock, paper, or printable fabric and iron-on transfer sheets. Handy package shows each design. JPEGs are resizable for custom projects. Requirements: For personal use only. Contents are subject to the Angel Policy on the CD. Windows 7 or newer. Mac OS X or newer. 10 MB hard drive space, 32 MB RAM (128 MB recommended). CD-ROM drive, color printer. If you have any questions about this product by STORE SMART, contact us by completing and submitting the form below. If you are looking for a specif part number, please include it with your message.